The practice of extreme hospitality was the third lesson I learned from Kasr al Dobara Evangelical Church (KDEC) about being a Christian. It is also a lesson we learn from the apostle Paul. It was the same attitude my Jesus-following Egyptian friends had. During our 6 days with them, my friend Mike and I never carried a bag, paid for a meal, or drove a single kilometer of Cairo’s mind-bending traffic. We were greeted with a smile, offered food and drink, and thanked for making the trip by every single Egyptian we met with. We were never left alone, never unwelcome, never mistreated. I was not even allowed to pay for the Arabic Bible I wanted for a keepsake or the delicate wood crosses that were gifts for my wife. Our needs were met before we knew we needed them and every bill for every accommodation was paid for by the Egyptians. The way the Egyptian Christians treated us was indeed hospitable, but it was only the tip of the iceberg. Below the surface, where the dark and dangerous waters swirl, their gospel-centered hospitality has been tested and revealed time and again. I told a portion of this story in a previous post (Political Unrest is Good for the Church), but it is worth repeating in full to show the kind of Christ-centered hospitality that rumbles at the heart of the members of KDEC. KDEC sits in downtown Cairo, only a few blocks from Tahrir Square, the ignition point for Egypt’s Arab Spring. The Arab Spring was a series of protests, demonstrations, and civil wars that erupted across the Middle East from 2010 to 2013. In Egypt, it resulted in two revolutions in three years. Cairo is just beginning to taste the return of peace and order. During the violence that rocked downtown Cairo, KDEC set up a temporary “field” hospital inside their church. Rooms were cleared for hospital beds. Church furniture was re-commissioned as hospital furniture. Doctors and nurses who attend the church risked their own lives to tend to the injured and dying strangers dragged in off the streets. They operated in a safe haven opened by Christians, but it was not only for Christians. Most of the bodies that were repaired, the souls that were prayed for, and the people who received these giant acts of extreme hospitality, were Muslim. Some were enemies of Christianity. All were in need. KDEC’s hospitality knew no bounds because Christ’s hospitality knows no bounds. And it wasn’t the end. Another example of the church’s “looking to the interests of others” lay right outside the impromptu medical clinic. When the sirens rang out the call for the daily Muslim time of prayer, the Christians of KDEC provided safe floor space and mats for the Muslims on the church’s grounds. Then, they linked arms, surrounded them, and kept protective watch as they prayed to their god. How did the Muslims respond to this extreme hospitality? They returned the favor. When their prayers were finished, they faced the raging mob outside to protect the praying Christians inside. Little did they know, the prayers were for their salvation. This is not a story of syncretism or pluralism. It’s a story of extreme hospitality that bears witness to the God of scripture who welcomes all with the open arms of his crucified son. Let us be a church that is known for how we love our family and our enemies. Let us be a church that welcomes travelers from around the globe and neighbors from around the corner. Let us be a church that sets out to heal those hurting in our community without any hesitation. Do you have any examples of extreme hospitality? Please share by clicking “Leave a Comment” at the top of the post. I would love to hear them. Thank you KDEC for reminding me what it means to be a follower of Jesus. You are true brothers and sisters in Christ and I am thankful to God for the way he is using you to impact the Muslim world at your door step, as well as your Christian brothers from across the globe. What a beautiful story and picture of how we as the church should be loving people – not only meeting their needs but going above and beyond to needs they didn’t even know they have. I’m so glad I found your blog! 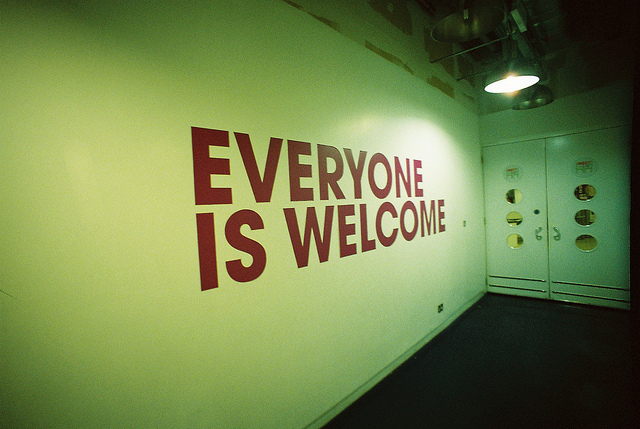 You’re a great writer and I love this picture of radical hospitality. Amen. It’s such a challenging and powerful story. And I’m so glad you found the blog too. It’s great to have you as a reader!